Plaster room instruments not sterile and used in plaster application and removal procedures in Plaster room and in postoperative orthopedic surgery and for stabilization. Short handle with a long blade, blade contain full of sharp serration to cut the plaster. Nowadays electric saw replaces this one, followed in some of the hospitals. Plaster saw works on electrical current with some of the safety features. The saw blades stop when automatically touches the skin surfaces. The saw blades cut only hard material like plaster and bandages. Shear appears like a sharp comb in curved circumference with serration. used to separate the plaster cut by the plaster shear or saw. Advance into the gap of the incision and spread it to open the plaster dressing. This scissor used for cutting bandages and cloths in the plaster room as well as in the emergency conditions. The blunt tip helps in enhancing the plaster without any harm to skin or wound. The other blade of the scissor helps in cutting scissor. Sterilization of the instruments by Autoclaving or chemical sterilization. 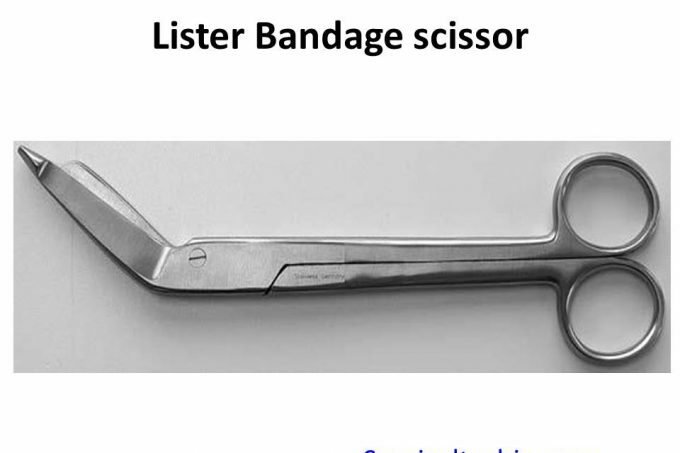 This scissor maximum not used in the surgical purpose, rarely used in the Delivery Labour room for cutting Uterus in Episiotomy procedure. The surgical blades designed in a manner that, it will cut all of sudden in one cut. The only bigger size of the blades used in the plaster cutting purpose Example 22,23 etc.